Late this past Saturday night a tornado ripped through Millbury, Ohio and its surrounding communities. Millbury has a special place in my heart, not only because my grandparents lived there, but pretty much my entire family – my parents, aunts, uncles, cousins, along with family friends – all live in or around the town. Though, I am thankful that all my family members are safe and sound, it is still painful for me to see such a great community in ruins. Hell, I pretty much spent half my childhood in the town while visiting my grandparents and other family members. 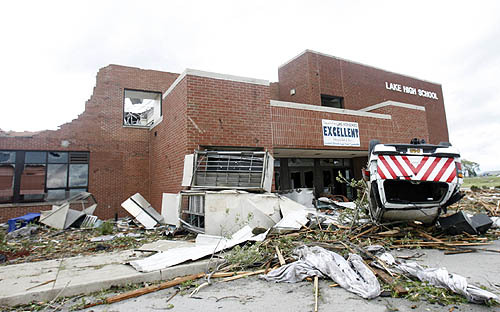 In fact, in this video (which is followed by an article about the twister), you’ll see what is left of many people’s homes and also of Lake High School’s Field House (note: the photo above is only of the school itself – the Field House was leveled) that is/was named after my grandfather. When something like this hits so close to ‘home’ it seriously makes you think about what’s important in life and to be thankful for what you have – health, family, friends, etc. One big thing I’m thankful for is my parents getting lost while on their way back from visiting late that night. Even though their home was relatively undamaged; a house only 4 places down was totally destroyed. If my parents hadn’t gotten lost on their way back home, they would have been huddled in the basement, wondering if their place was next. Having said that, I have decided to start a collection that will then be sent to the school to help rebuild the Field House. If you are interested in donating, you can let me know by sending an email to me at: ty_schwamberger@yahoo.com with an appropriate subject line so I know it’s not spam. Thank you.